a total of 12 guestrooms with elegant decor and modern comforts. Parking facility is available for free. 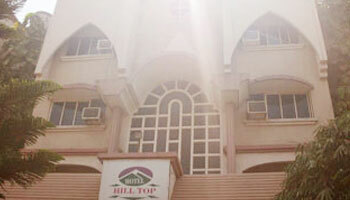 Rooms at Hotel Hilltop come equipped with a cable television and mineral water. The attached bathrooms have a hot/cold running water facility and bathroom toiletries. Security Guard, Doctor on Call, Backup Generator, Airport Transportation, Parking, Breakfast Services, Travel Counter, Laundry Facilities, Room Service, Currency Exchange. Iron/Ironing Board, Cable/Satellite TV, House Keeping, DVD Player, Attached Bathroom, H/C Water, Air Conditioning Room, Toothbrush/Razor on Request, Wakeup Calls.